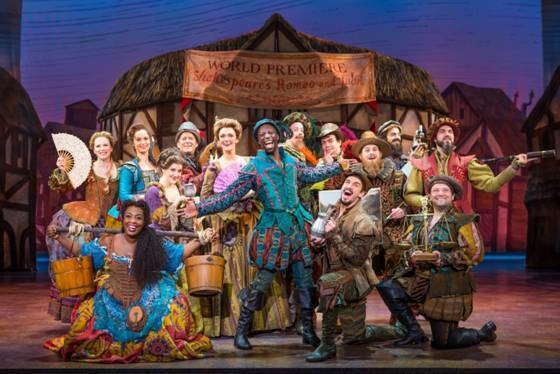 SAN FRANCISCO, CA – SHN opened its 2017-1218 Season with “Something ROTTEN.” a new, original smash musical, which has been nominated for l0 Tony Awards® including Best Musical, on Broadway. Directed and choreographed by Tony Award® winner CASEY NICHOLAW with book by Glove and Tony Award nominee KAREY KIRKPATRICK and best selling author JOHN O'FARRELL, and music and lyrics by Grammy-Award winner WAYNE KIRKPATRICK and KAREY KIRPATRICK who also conceived the story, “Something ROTTEN” retrogrades the audience to the times of the Renaissance in England, introducing it to the actors in the Elizabethan Theatre (l562-1642) allowing it to visit the Globe (1599) and even meet, in person, its most famous poet and playwright: WILLIAM SHAKESPEARE. When the curtain opens, we find ourselves in l500's London. Scenic designer SCOTT PASK, managed to recreate it on the SHN Orpheum Theatre's stage in the structure of the houses. On the street, a group of people attired in the elaborate designs of GREGG BARNES, gather at the door of the GLOBE THEATRE, where a banner announces the premiere of SHAKESPEARE's play Romeo and Juliet. Standing at the center of a group a minstrel (NICK RASHAD BURROUGHS) sings in a full voice, Welcome to the Renaissance with the choir, welcoming the audience to the time where everything is new. The age of poets, and painters and Bon Vivants. The Renaissance. Befitting the times and place represented on the stage, one of the principal characters in the story is "The Bard" himself, William Shakespeare (PASCAL) who in this musical acts like a Rock Star. He is pompous, and vain, believes that he is the best, and according to Nick Bottom (McCLURE) a plagiarist writer and poet who steals ideas from all the other English playwrights to write his own dramas. Another principal actor in this musical is Nick Bottom (McCLURE) who is another playwright and who hates Shakespeare so much, that he sings a song saying so. The reason, may be envy (he wishes he were as famous as Will) but he is only an struggling playwright with not a single adoring fan. At the moment, poor Nick is in a pickle. He needs to write a play and he has no idea what he is going to write about. To complicate matters, Bea (MAGGIE LAKIS) his wife, tired of eating cabbage soup just got herself a job disguised as a man. This humiliates Nick even more, so desperate and still searching for and "idea" for a play that people will really like, he steals money from his wife to pay Nostradamus nephew (BLAKE HAMMOND) who is a soothsayer, to search the future of theatre, and find him an idea. and after Nostradamus does it his answer is: Omelette, a musical. Sadly, our third principal character Nick's brother Nigel (GRISETTI) a great poet who had always helped Nick, before to write his plays, this time refuses to help him write Omelette. And while Nick struggles alone to write his musical, we listen to the song The Musical the showstopper elaborate sing and dance number, composed with short bits of songs of Broadway's musicals trying to identify them, and smiling when we do. And we Laugh watching the sickles'-carrying skeletons singing "The Black Death" and laugh again watching the realistic egg and ham costumes worn by the group of dancers on the stage. 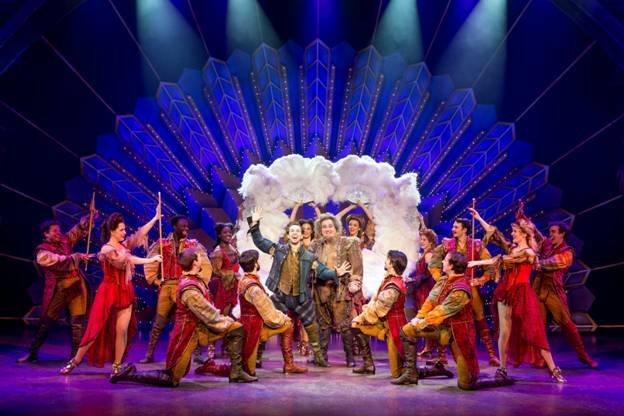 The cast of Something ROTTEN presented at SHN Orpheum Theatre in S.F. 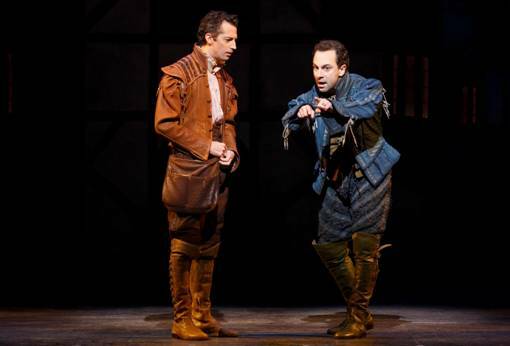 And the plot of “Something ROTTEN” keep us laughing. As a musical the songs are tuneful and all have cute lyrics. The situations are silly but realistically represented, the dialogue is funny. Its plot is unique. It has everything: love, hatred, envy, religion, bigotry, creativity and plagiarism to name a few. The story is well-structured and its ending, true or not true, is interesting. 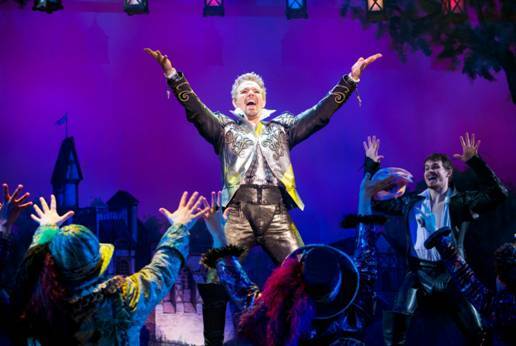 All its characters are tridimensional, and their acting and singing is professional.. As a play, it even has a premise: “To Thy Own Self be True.” And to be true, about reviewing this new musical, we can only describe it as ingenious. 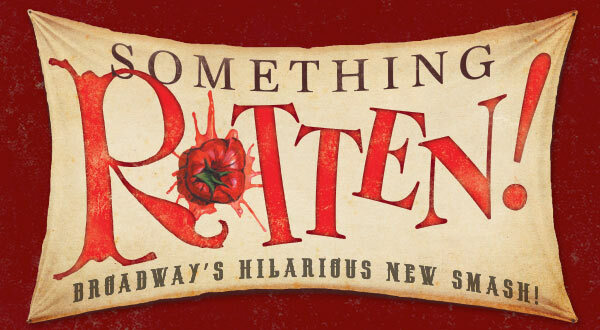 SOMETHING ROTTEN will play at the SHN ORPHEUM THEATRE 1192 Market Street in San Francisco until September 10. For tickets you can go online to www.shnsf.com or call 888-746-1799.